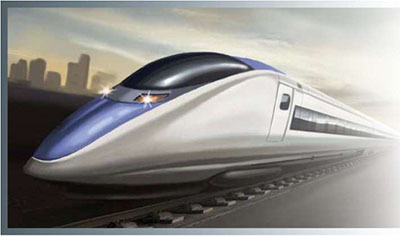 The goal of the game is to have the most powerful railway network! 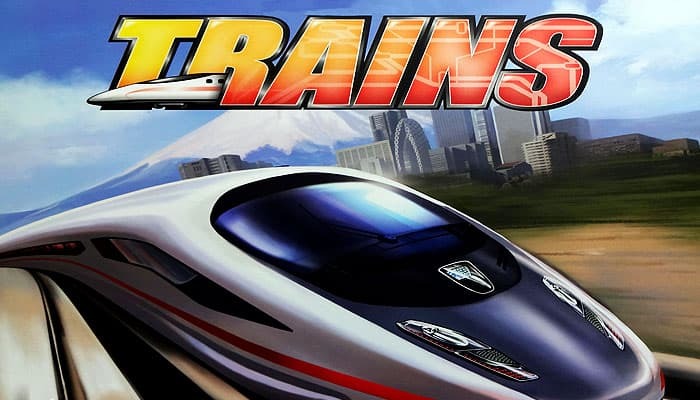 You accomplish this by collecting Victory Points from cards, railways, and stations. To gain Victory Points, you build a deck using cards from the various options that will be available to you. You will build the deck as you play the game, with each player starting with the same small set of cards. Use these cards to build railways around Tokyo and Osaka, and ensure your deck runs as effectively as possible turn to turn. First, let's get to know the cards. We'll look at things like the board and the pieces soon, but most of the action is on the cards, so that's a good place to start. A. Cost - This icon shows how much money you must spend to buy this card from the Supply. B. Value - This icon shows how much money this card provides for you when played. C. Card Type - This symbol shows what type of card it is. Note that some cards may also have the red action symbol in their text, this means they also count as an Action card along with whatever their primary card type may be. D. Effect - This is what happens when you play the card, along with creating any money from the Value icon. 1. Choose which side of the board to use, Tokyo or Osaka. Each side has a different map and will provide a different experience. Place all station tokens beside the board. 2. Each player selects a color and takes all the rail tokens of that color. Then place each players' scoring token on the victory point track on the 0 space. 3. Each player takes 7 Normal Train, 2 Lay Rails, and 1 Station Expansion for a total of 10 cards, shuffles them, and places them face down in front of him. This forms the player's starting deck. 4. Create the common Supply of cards. 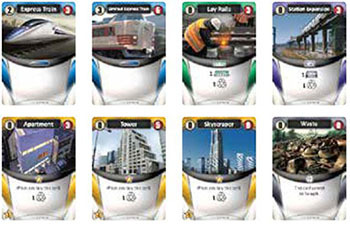 Place the cards Express Train, Limited Express Train, Lay Rails, Station Expansion, Apartment, Tower, Skyscraper, and Waste in stacks on the table. You will use these cards in every game you play. 5. Take the randomizer cards and shuffle them, then draw the first 8. Put the corresponding stacks of cards on the table, then return the randomizers and any unselected card stacks back to the box. Every game you will choose these 8 cards at random, so every game will be different. 6. Return any unused Normal Train cards and tokens to the box. 7. 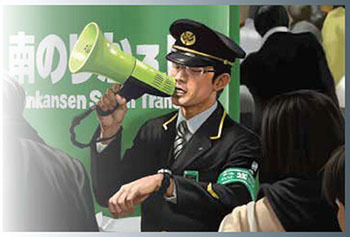 The player who most recently traveled by train is the starting player, naturally. The game starts with each player drawing a hand of five cards from their deck. Going clockwise around the table players place one rail token as their starting point. Players may not place a starting point on a sea space, a remote location, or where another player has already placed his. When all players have placed their starting rail token, you are ready. 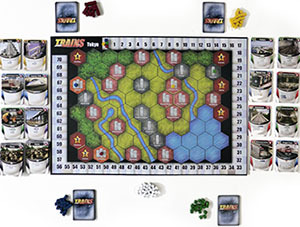 Beginning with the starting player and proceeding clockwise, players will take turns playing cards, laying rails and building stations on the board. When a player has completed his turn, the next player takes his turn and so on until the game ends, at which point the player with the most Victory Points wins. 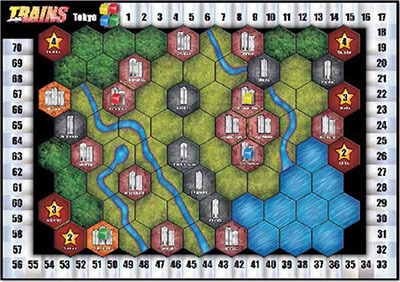 Getting Started - As the game progresses, and spaces become more crowded, the cost to build rails may well increase, so there's some advantage to trying to stake out your own area on the board. During a single turn, the active player may both play cards from his hand and buy cards from the Supply, in any order, as many times as he or she chooses. However, the player must fully complete each action one at a time - a player may not buy a card in the middle of playing a card, or vice versa. When a player has finished playing and buying cards, go to the Clean Up stage (see page 8) after which the turn then passes to the next player. A player is not forced to either spend all the money generated or play all of his or her cards. A player may also decide to simply pass the turn, neither playing nor buying cards at all. 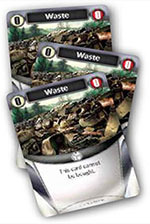 A player who passes his or her turn may, as a special action, returns all Waste cards from his hand to the Waste deck in the Supply. Playing a card means to take the card from your hand and place it face up in your play area. You gain as much money as the card's Value (top left number). This "money" is currency you can use to buy further cards. Gained money is only valid for the current turn (any unspent money is lost at the end of the turn). If the card you played is an Action card, you may apply its effects if you wish. If you choose not to apply its effects, you still gain the money from the card. If you choose to apply the effect, you must apply it in full, and the effect is resolved in order from top to bottom (in the case of cards with more than one effect). If some of the card's effects cannot be applied, you cannot apply any of the effects. There is a single exception to this rule, in that if a card requires that you gain Waste, and there are no Waste cards left in the Waste deck, you may still apply the other effects. Action cards' effects must be applied immediately or not at all. You cannot "save" the effect of a played card for later. 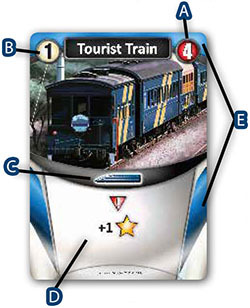 Example 1: When you play Tourist Train, you may, if you wish, move your VP marker one step forward along the victory point track on the board. Example 2: If you choose to apply this card's effects, first you gain 1 point worth of rail laying (to place a rail marker on the board this turn), then you gain 1 Waste card. Lastly you gain the effect that laying rails on mountains this turn costs nothing extra. See below for further explanation of these card effects, but the point is if you decide to apply the card's effects, they all must happen, and in that order. However, if there are no Waste cards left, the card's other effects can still be applied. Buying a card simply means taking the card from the common Supply and putting it into your "gained cards" area. They do not count as being played this turn, and they are not in your discard pile yet, but will be when the turn ends. In order to buy a card you must have enough money from cards you've played to pay for the card's cost. You start each turn with 0 money, and add to it with cards you play. You can buy several cards if you wish, including multiple copies of the same card, as long as you have enough money to pay for them. Remember that money is only valid for the current turn, so either you use it or you lose the unspent money at the end of the turn. If a card's stack in the Supply has run out, you can't buy those anymore because... well... they're not there. Also, you can never buy Waste cards. If you completely pass your turn, (neither playing nor buying cards), you may, as a special action, return all Waste cards from your hand to the Waste stack in the Supply. If you choose to do this, you must return all of the Waste you have, you cannot return only some of them. There is absolutely no reason to hang onto Waste, so the bit about keeping some of it is just us being rules-y. It serves no benefit other than to clog up your hand. However, you can sometimes "ride it out" with just one or two Waste in your hand, still accomplishing things on your turn. However, if you ever draw a hand with 3 or more Waste cards, you may be better served cleaning them out for future turns. Once you are finished playing and buying cards (or returning Waste to the Supply), put all cards in your play area, all cards in your "gained cards" area, and any cards left in your hand into your discard pile. Then draw 5 new cards from your deck and your turn is over. If your deck is empty and you still must draw cards, shuffle your discard pile to form a new deck, and draw the rest. Note that the discard pile is not reshuffled just because your deck is empty, it is reshuffled only when your deck is empty and you are required to draw or reveal a card from your deck. This goes for all times when your deck may be empty, only reshuffle specifically when you need to draw or reveal a card. You draw your new hand at the end of your turn, this gives you the entire time during other players' turns to plan out your strategy for the next turn. While their plans may disrupt yours somewhat, you can usually make the game move along like a well-oiled... train... if you plan ahead! Once your turn is over, check and see if the end of game conditions are met. If they are, the game ends and the player with the most Victory Points wins. If not, play proceeds clockwise around the table. There are some broad card effects you'll see on various cards. This section explains them. You may only place tokens in spaces adjacent to spaces in which you already have tokens. Please note that spaces separated by a are NOT considered adjacent. You may only have 1 of your own tokens in a space, though several different players may have tokens in the same space. Depending on where you want to place your token, you may have to pay extra money (from cards you've played this turn). If you don't have enough money, you can't play the token. Below is listing of the spaces and the extra costs associated with them. Sea You can't build here. If you play a Lay Rails and you want to build on a river space, you have to pay 1 money. You want to place a rail token on a city space (+1 money cost) that has two stations (+2 money cost) and 1 other player's rail token (+1 money cost and gain 1 Waste card). You have to pay 1+2+1 = 4 money to build there, and you must take a Waste card. When a card refers to "cost" or "a cost" it is referring to the amount of money. 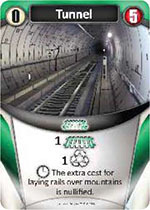 Although Waste is often part of the effect of a card, it is not considered part of the cost. For example, Steel Bridge negates costs for laying rails over rivers, so you would not have to pay additional money, but it does not negate the gaining of Waste for laying rails. This allows you to place a station token on a city space. The maximum number of stations that can be on a city is the number of buildings shown on the space. This means you have to take a Waste card from the Supply and place it into your "gained cards" area. Waste cards are a burden. You can't do anything with them and they take up space in your deck. If there are no more Waste cards in the Supply, you do not have to take a Waste card. Draw simply means to draw the stated number of cards from your deck. If you deplete your deck this way and must continue drawing cards, reshuffle and continue drawing. If both your deck and discard are empty and you still have to draw cards, you do not draw any more. When an effect trashes a card, the card is removed from the game and returned to the box. Any 4 of the card stacks in the Supply - excluding Waste - are depleted. Any player has used all of his rail tokens. All station tokens have been placed on the board. For each VP noted on a player's gold colored cards (in hand, in discard pile, and in deck) the player gains the noted VP. 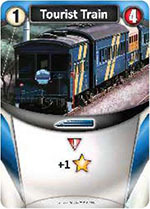 If two or more players tie for the most Victory Points, the player with the most rail tokens on the board wins. If players still tie, they share the victory.